History: Yes, The First Evil is the actual ultimate Big Bad of Buffy’s final season. But it was an incorporeal plot device—the kind of narrative one-upmanship that’s supposed to give weight to the enormity the gang faces in its final season, but doesn’t, because we’ve only seen glimpses of it before. Plus, it doesn’t do anything other than order minions around and show up as people who have already died to make everyone feel bad. It’s a concept, not an enemy. Buffy may as well have been at war with fear, or civic duty. It was The First Evil’s champion—the priest Caleb—who did all the legwork. A defrocked priest, Caleb was guilty of murdering at least two girls before he even came in contact with The First Evil. When approached by the entity self-described as “beyond sin, beyond death,” Caleb swore his loyalty in exchange for a fragment of the ancient being’s power. He was entrusted with destroying the Watchers and killing all the potential slayers. 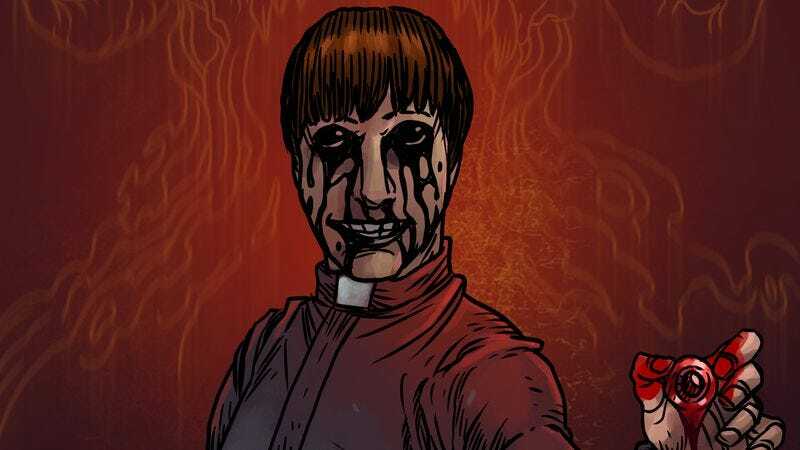 An evil preacher type in the vein Rev. Harry Powell, Caleb was prone to speaking in sermon, offering up floral snippets of Scripture on the end of the world when not just thinking about how gross girls are. How’d they bite it? When Caleb moved to town, he took up residence in an evil winery that stood over the site housing the Slayer’s most powerful weapon, the Scythe. It was freed and eventually made its way into Buffy’s hands, where she promptly used it to slice Caleb clean in half from his groin up. The First Evil, being a timeless being of elemental creation, can’t be killed as such. But a magic amulet-wielding Spike did sacrifice himself to destroy Evil’s army and bring all of Sunnydale down on its head, which at least shut it up indefinitely.